Gerald Enrique del Campo, poet, musician, photographer, magician, philosopher, painter, writer, and lecturer on occult and religious topics was born in Cordoba, Argentina on January 14, 1960. From 1982 till 1986, he studied Enochian Magick with David Kennedy, Israel Regardie's personal secretary. In 1987 he joined Ordo Templi Orientis, where he eventually became Master of RPSTOVAL Oasis. Later he served that Order in the capacity of Quartermaster and volunteered to serve an eleven year term with the OTO's Electoral College. From 1988 until 1990 he was a member of the College of Thelema and studied under Phyllis Seckler. In 1989, he became a founding member of the Temple of Thelema. In that same year he joined Fraternitas Lux Occulta and studied under Paul Clark. In 1998 he became a members of The Hermetic Order of QBLH. On August 23, 1999 he founded the Order of Thelemic Knights, a Thelemic charitable organization based on the virtues soldiering and chivalry as exemplified by Templarism. On January 1, 2003 he was consecrated Bishop and received Apostolic Succession and adopted the name Tau Apollonius. On that same occasion he founded the Thelemic Gnostic Church of Alexandria. 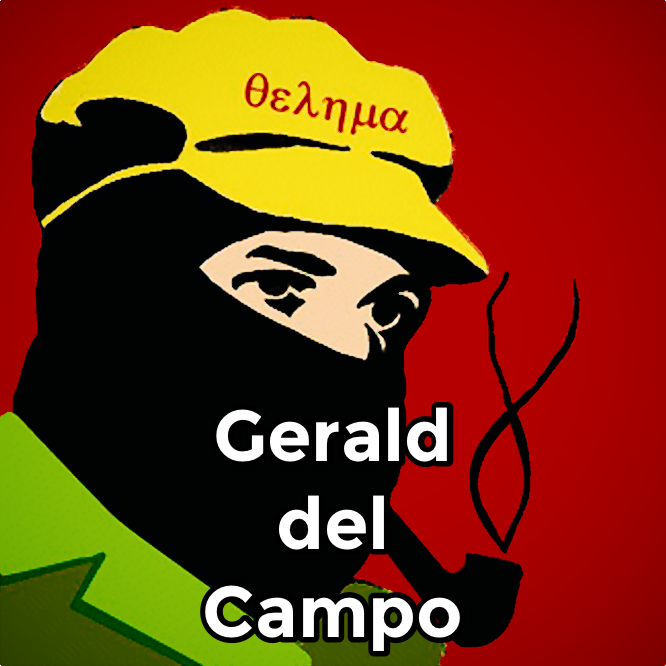 As of today, Gerald del Campo has published two books. New Aeon Magick: Thelema Without Tears (Luxor Press Inc; 2nd Rev&En edition June 1, 2000), and New Aeon English Qabalah Revealed (Luxor Press Inc 2003). New Aeon Magick is unique, in that rather than recycling already published material, it is focused on Thelema as it had manifested in his life at the time. It is also an excellent Hermetic Qabalah and comparative mythology source. New Aeon English Qabalah Revealed is a primer on the New Aeon English Qabalah and a system of gematria referred to as Cipher 6. In this book, del Campo shows the relationship between the English letters and some very important passages of The Book of the Law. The following list include some of his more popular writings in the area of Thelema, religion, philosophy and mythology which have appeared in various magical journals. They are not listed in any particular order, nor do they represent the entirety of his work. This list does not include his papers on magical tech, poetry or dissertations on photography, brewing or technical writings. The fine print: No part of this web site may be copied, transferred or re-created without the written consent of the author. ALL pictures and page design within are either trademarked and/or copyrighted and protected under National and International copyright laws as well as Fair Use Provision Acts. ANY violation of the above will result in prosecution to the fullest extent of the law. These images are not in the public domain.